The internet is the great equaliser. Online you can be anyone you want, indeed pretend to be anyone you want – and it is no surprise that with a fantasy game about a fantasy real life you can make your own way, the Sims series online and offline attracts plenty. Look no further than the phenomena of the ‘Simself’ – for every SharkloverPlayer (Catloverplayer) posting up an honest version of themselves, there’s always going to be those whose Simselves would only be true after 48 hours worth of liposuction and a lot more salad in their diet (isn’t there, Lisa!). It’s all part of the escapism that makes the game fun. One of the largest groups of people to be found online are those who may face heads turning away from them in real-life, and no surprise that the disabled, those with mental illness, etc. rank highly (and let’s not kid ourselves that there isn’t still a fair old bit of unconscious reticence towards them from society as a whole – even in the 21st century ): it’s the one place they can be guaranteed to be treated not at face value, but in how much fun they are to be around with online. 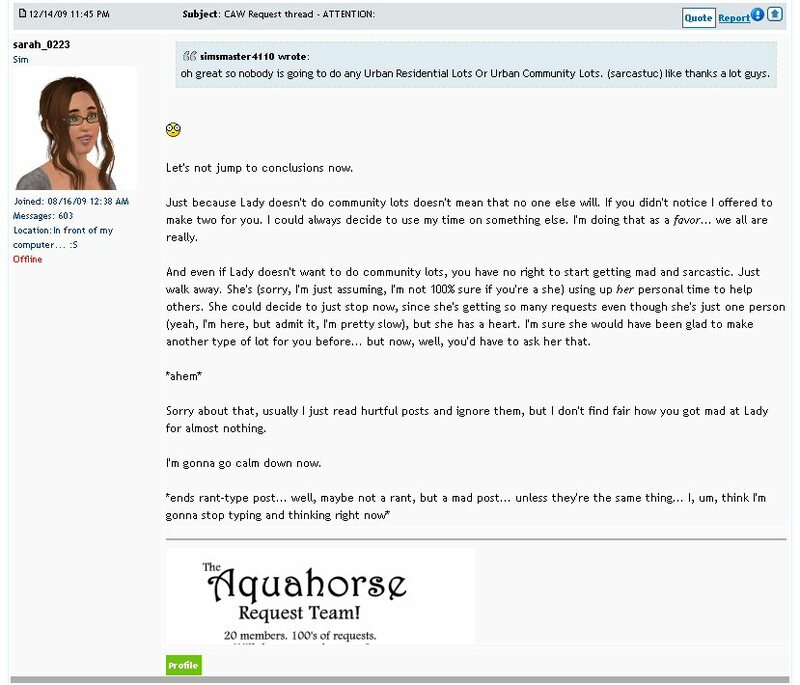 Perhaps that was the reason Madame Lee stirred up a bigger hornet’s nest than she bargained for with her demand for disabilities within the Sims in the EA forum this year – some may have felt she was trying to ‘walk the ghost’, others meanwhile didn’t like the idea of the game about a fantasy ‘perfect society’ becoming that bit ‘less perfect’, and that it was one call for realism too far. Still others felt that in a more inclusive age, it’s time that computer games reflected this, and the debate will doubtlessly crop up again in 2010. 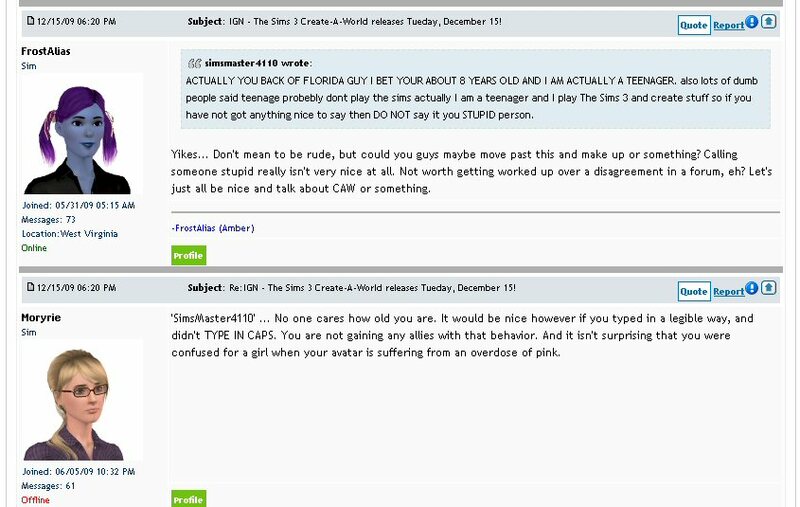 There is however the other side of the coin: those who will use disabilities and illnesses as a moral club to beat others with, and the Simming community is no more immune from this than the real world. 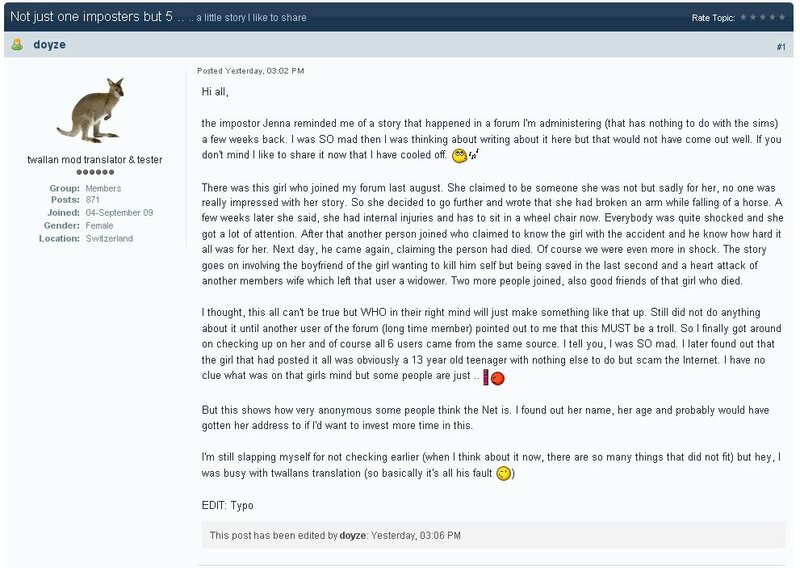 Now no matter how ‘upset’ Simsmaster4110 was, she was completely out of line in trying to use her condition as something to establish some ‘moral high ground’ with, especially as one suspects that she knew that Sarah_0223 – who is a nice soul that doesn’t like seeing people on the board getting hurt – would be inclined to be conciliatory if they did this. Browning backed off, but Simsmaster4110 – still seeing Sarah_0223’s good nature as something to take advantage of – was not for getting out whilst the going was good. It’ll be a bloody plate glass window at high speed if you keep this up, sunshine! 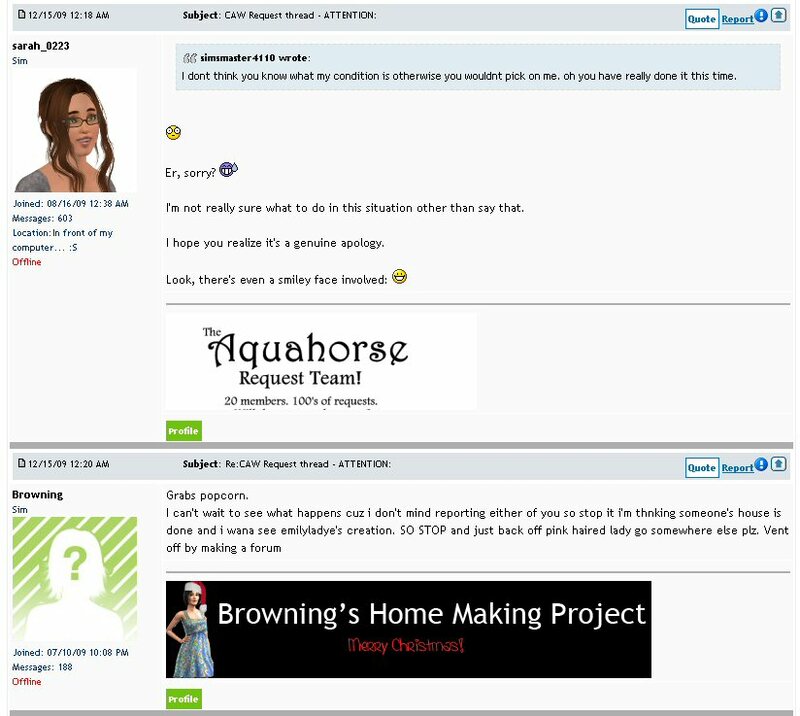 Browning came back to say that Simsmaster4110 perhaps ought not to be posting up such personal information about themselves in the first place, and it was only when Lady Emilye told Simsmaster4110 that they’d blown it and to leave the thread that they apologised. 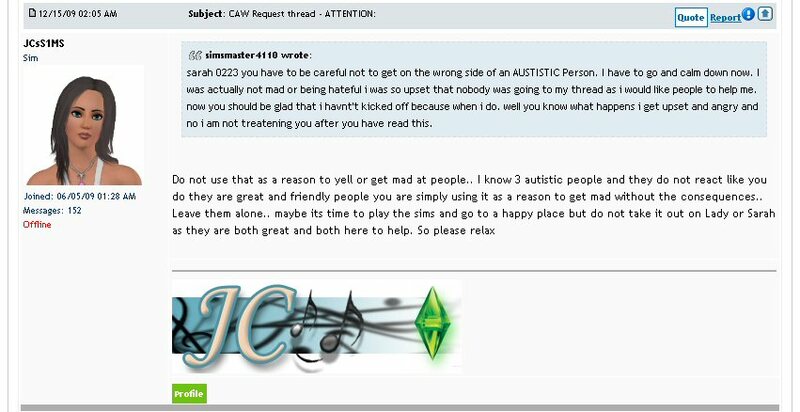 We wondered whether one of the three autistic people JCsS1ms was referring to happens to be one of those you’ve all been voting for recently in the Most Entertaining Poster (Within EA Forum Only) category for the 2009 ‘Six of the Best’ Awards – but we can guess only too well how they must have felt over Simsmaster4110’s boorishness if they got to see it. And that put the tin lid on it – another example of why forewarned is forearmed so that – as the Isz would put it – you know when there’s a big kettle of crazy to avoid. An attention whore is an attention whore, and it matters not two hoots what sort of sore paw they may hold up in their ‘defence’ – one doesn’t require to be completely able-bodied and uncertifiable to know the difference between being civil and boorish – especially when you can always pause before hitting the send button, no matter how angry you are. There is not a single person on any of the forums that leads a perfect happy problem free life. 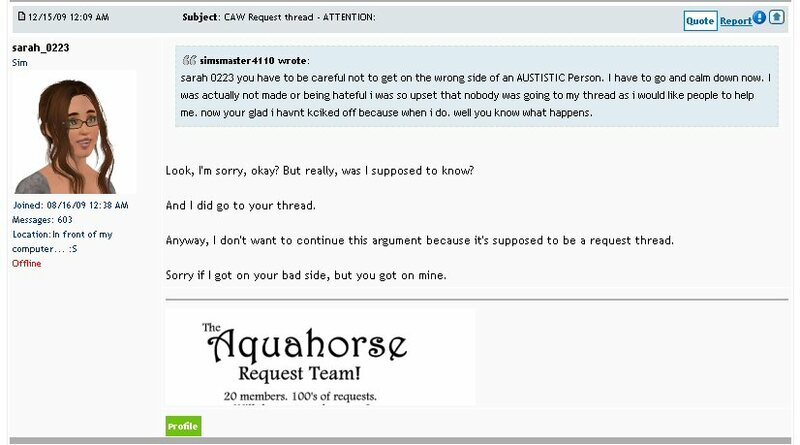 Anyone that’s a member of the large Boolprop Fight The Addiction False forum will testify to that (they have specific sections for just about any life problem imaginable – which is a good way to keep it from the General or Off Topic boards where some of the issues may make some people feel uncomfortable). However, as much as the Internet can be a place to gain support and comfort from such things – including with those sharing common interests to begin with such as The Sims – it is also a place where others go to escape from the miseries of the real world, and that equally has to be respected. Buying Sims 4? Go here FIRST! Why call this ‘The Mare’s Nest’? Are SimmieJunkie & GrammarKing One & The Same? Is LilDevilGirl9554 our Annoying Devil? Aarin’s Spectacles & Jazz-Hands – 20/20 Vision Or Same Old Myopia? Poor Maddy444, with ‘friends’ like these, she doesn’t need enemies! Are There Too Many Sims Forums? PollySim Puts The Kettle On – Time Jazzers Smelled The Coffee! Reclaim Your Brain: What self-styled ‘consumer champions’ RYG DON’T want you to know! 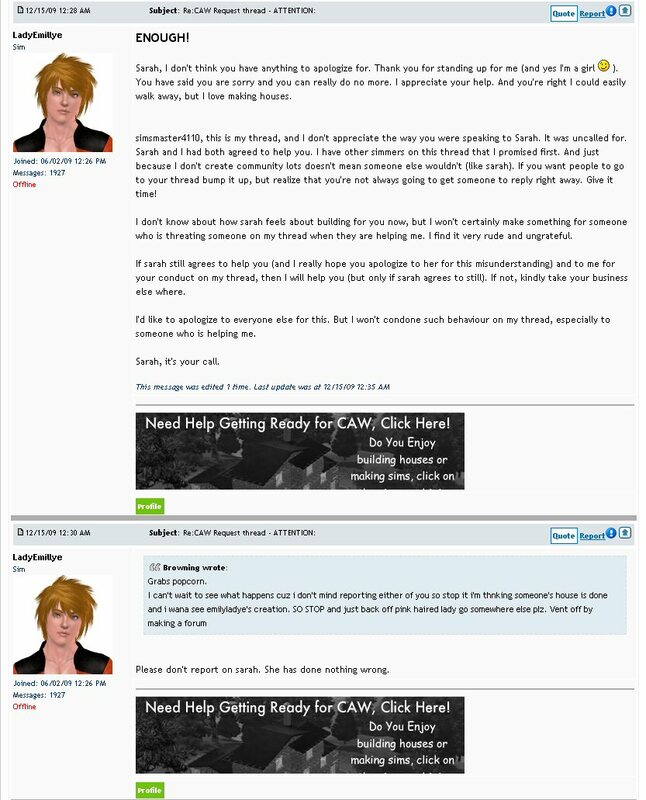 Driven To Tiers: How Simple Simon and Hasty Halston Helped Sesert34 To Run Amok On The EA Forum. EA Wins A Shorty Award – A Joke Social Media ‘Award’ For A Joke Social Media Producer! Downloads Select Category A Berry Sweet Site A Rotten Legacy Bear Mountain Creations Black Pearl Sims Boolprop FTA F (Bopftaf) Builders Boulevard Crazy Town Custom Sims 3 – Custom Sims Dizzy Of Oz (Sunnisweety) Downloads Flutterby's Flutterings Grouchy Old Bat Sleeping Dragon Half Man Half Biscuit I ♥ Sims (Sims 3 Society) Jazz-Hands Kitty Klan Lisa's Gothic Rose Non-Sims Inspired NRaas Industries One The Juggler Raiders Of The Lost Island Consignment Shop Really Big Shoes Ruby The ConFuzzled SiManiacs Simatography Simpletons Sims 3 Marktplatz Sims Forums Sims International Film Festival Sims Nation Six Of The Best Skeletal Screams The Mare's Nest (& Related Garbage!) The Sisters Of Mercy The Wasteland Uncategorized Vidkid20's Sims Lair Wordpress Wordpress cut it out!